I just discovered this very cool feature of Konsole. 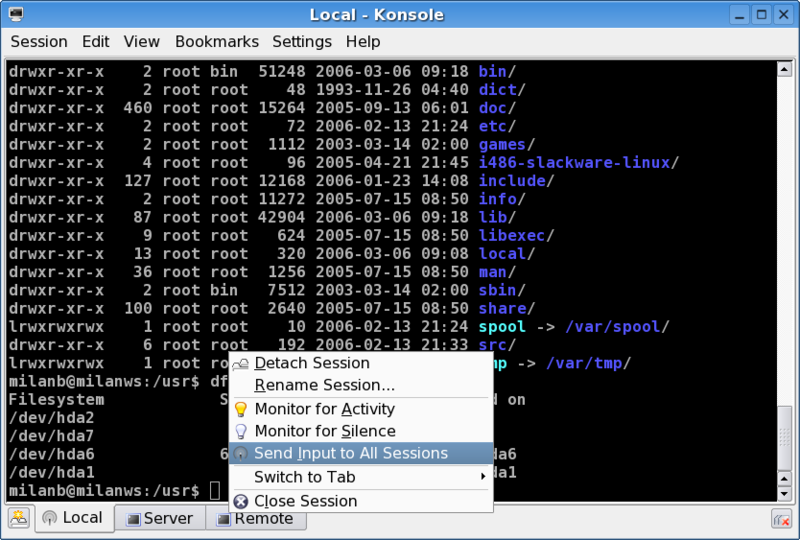 You can log into multiple servers (via ssh) and run the same command in each Konsole tab at once. It’s great when you have many computers with same configuration. Just log in, and select one of Konsole’s tabs to be the one to “broadcast” input to all others. It works for all tabs in a single Konsole window. It also useful when you have several users on the same computer, and you wish to make sure all of them have the same rights, and that they can perform some operations without stepping on each others toes. One of the problems is monitoring the effects of commands. Well, you can detach the tabs (Detach Session menu item) after you set up the broadcasting. If you have large enough screen, you can set up 8 or 9 windows nicely, and watch what’s happening. Really useful stuff. One warning though: don’t forget to turn it off once you’re done. It’s easy to forget yourself and start some clean-up job (rm -rf /) which is only meant to one of machines.